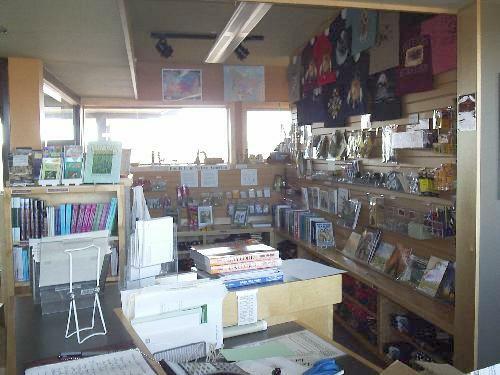 The present Visitor's Center was opened in 1999, and is located along the western edge of the Jeffers Petroglyphs Site. 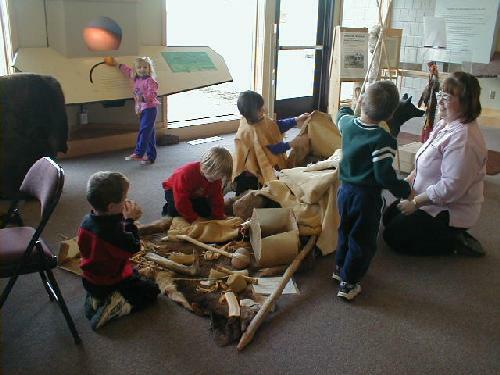 It is home to a number of permanent displays, several "rotating" exhibits, a multimedia presentation, a children's activity area, and the gift shop. 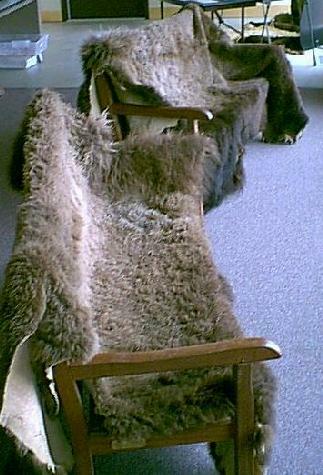 It also has rest rooms, drinking fountains, a picnic shelter, and benches covered with buffalo robes to rest on. Roots and soil layers of the prairie. 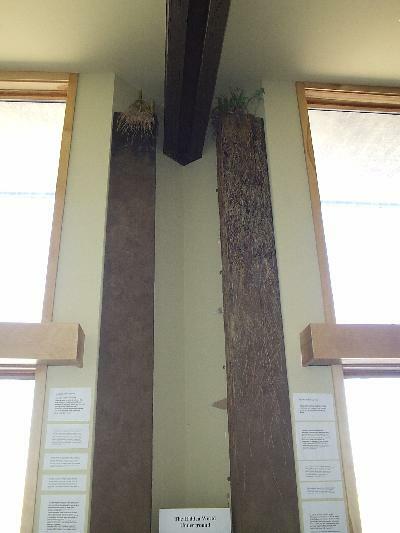 This display, running from the floor to the ceiling twelve feet above, shows the various levels of soil in prairie environment (topsoil, subsoils, and bedrock) and shows the root structures of several prairie plants, so you can see just how far down they reach into the soil. There are also coloring and activity pages for children to go with this display. Tools of the Ancient Peoples. 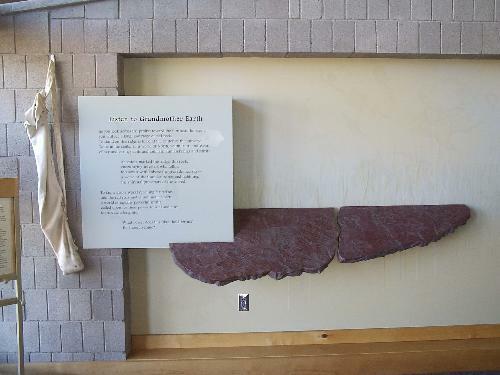 This display shows tools (both stone and bone), pottery, preserved meat, etc. Sunshine on the Petroglyphs. 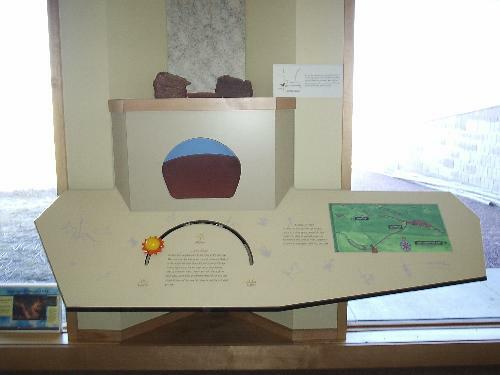 This display shows how the angle of the sun, depending on the time of day, affects the visibility of the petroglyphs. The travois was how their belongings were moved. We have one hooked up to a dog, loaded with all kinds of cool things. COMPLETELY hands-on. CP/AP to go with it. Also part of our 2 P.M. Programs. 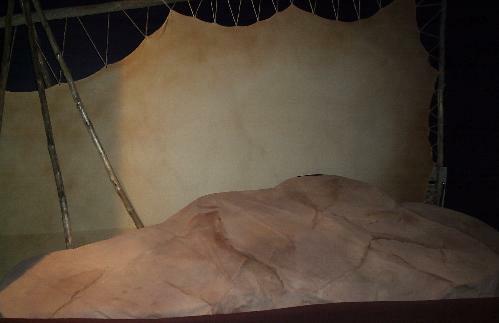 The multimedia presentation is shown in our auditorium on a large screen, crafted to look like the wall of a tipi and rocks. By large, we mean about 15' wide and 10' tall. You start the presentation yourself, and can watch it as often as you want. The auditorium is also used for lectures, displays, and exhibits, and at some point we hope to make it into more of a teaching area. The Children's Activity Area is an area reserved specifically for children. We always have several coloring pages and activity pages out for them to color, and we try to make these pages as educational as possible as well. 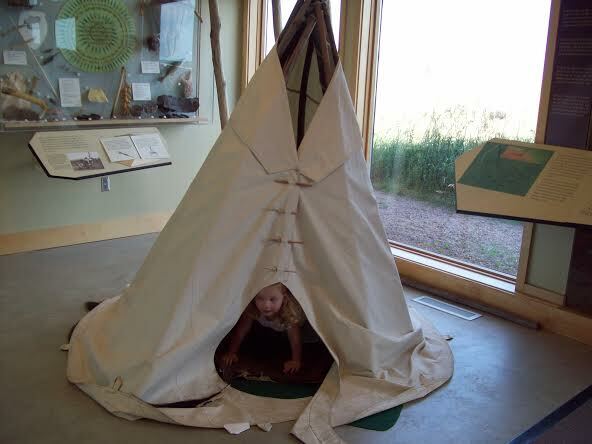 We have a small tipi set up for them, and some native american toys and games. 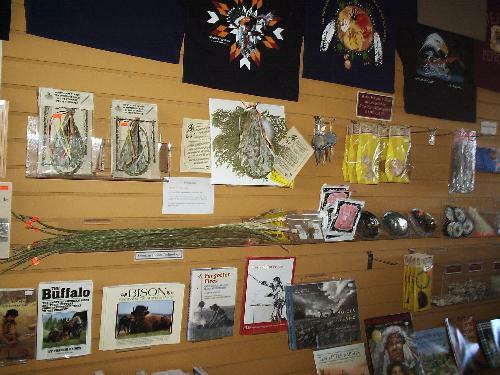 The Gift Shop is designed to help you learn more about the prairie, Native Americans, ancient tools and technology, and foods from native america. We don't sell souvenirs; we sell education. Whenever possible, we buy from Native Americans. Foods from Native America. 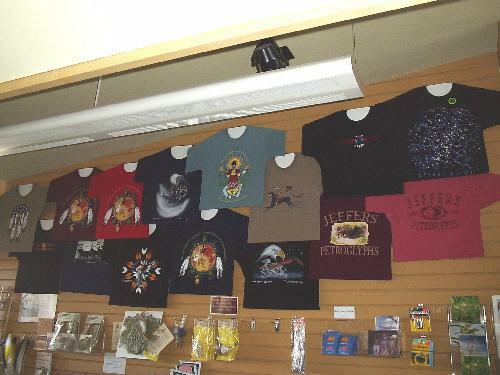 The "snack" foods we sell in our gift shop are foods that were traditionally utilized by Native Americans and which existed before contact with Europeans. Buffalo and other jerky, dried fruits, sunflower seeds, parched corn, and opther items. 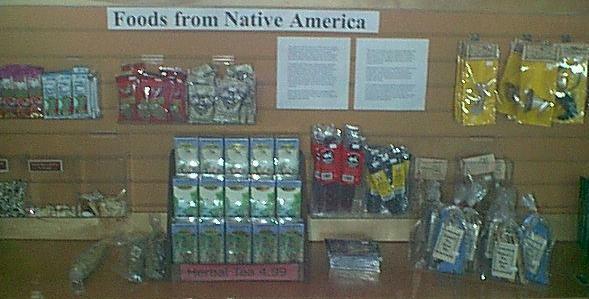 We also have some foods that were made and used by Native Americans, including parched corn, fry bread mix, etc. Jewelry. 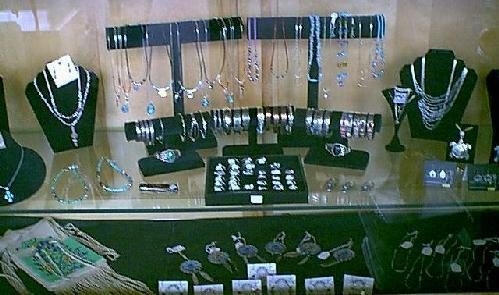 We sell jewelry that is handmade by Native Americans. 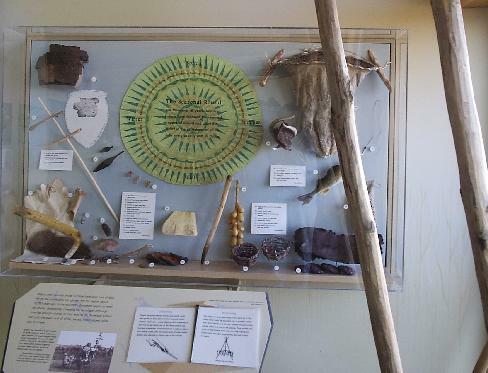 Atlatls and other ancient technology. 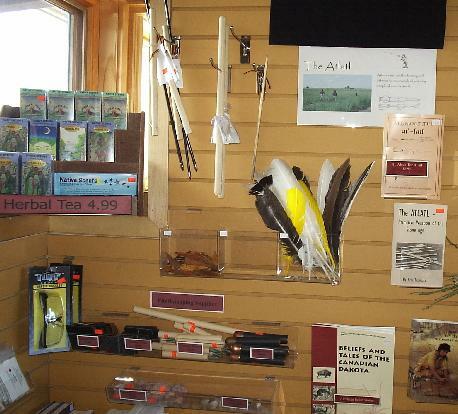 We sell not only finished atlatls and darts, but also supplies, books, and materials for making your own. We also sell flintknapping supplies, and hope to carry other similar items in the future. 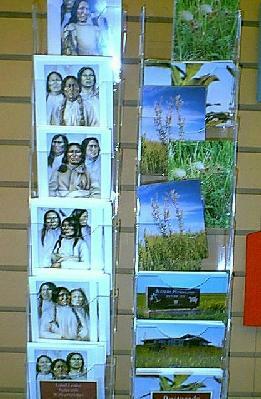 Postcards, many of the site itself. 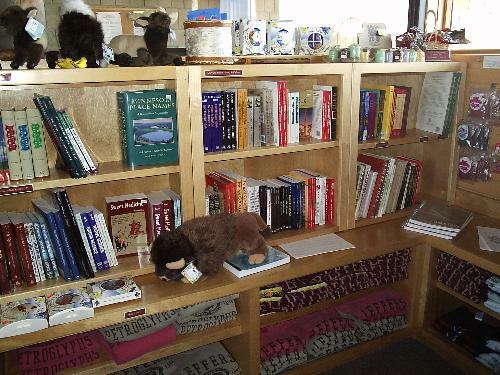 Scientific tools and supplies - we hope to add to this area soon, wtih such things as UV lights, red flashlights (for astronomy), pocket microscopes, binoculars/monoculars, weather equipment, and other learning tools.